derives its name from the Sanskrit language meaning Happiness. It brings us pleasure to guide you to a place of balance, calm, strength and contentment. KUSH treatments focus on balance and nurturance. Each healing ceremony draws from ancient Vedic and Tantric practices. Treatment ingredients are derived from premium sources carefully selected according to tradition and quality. The classic Ayurvedic therapy with warm medicinal oils, traditionally performed to increase circulation, promote lymphatic drainage and ultimately to preserve a youthful, vital and supple body. Our strongest massage combines assisted yogic stretches and Marma pressure point therapy with medicinal oils, designed to remove blockages at various energy centers of the body, re-vitalizing the whole system. This deeply relaxing sequence focuses on the areas where we carry the most stress and tension - the head, neck, shoulders and upper back. The clarifying massage oil helps to liberate fresh energy throughout the whole system. To compete the therapy, a blend of fresh hibiscus leaves is applied to cool and nourish the crown. 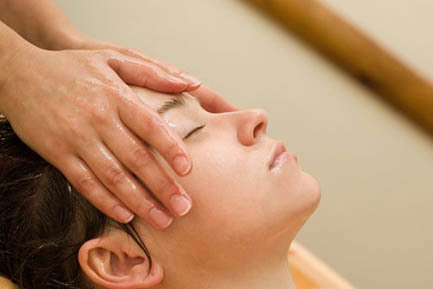 These clinical therapies are designed to support purification, balance and rejuvenation of the nervous system. Through the specific type, quantity and application of medicinal oils, these traditional treatments have a profound, nutritive effect on the 'subtle body'. These are not quick fix or spa treatments. Pre and post care procedures support the long term healing effects of these deep acting therapies. If you are considering any of these treatments, please consider a private consultation as well. For the full benefit, a course of 4-7 consecutive treatments is recommended. Book your treatments on relaxed day(s) that are free from other appointments, travel plans, social engagements, sunbathing, strong exercise, etc. Kindly come to your treatment with an empty stomach and evacuated bowels and, for women, when you are off your moon cycle, as that is when a woman's body is naturally detoxing. All oil treatments should be avoided during the first three days of menstruation as the oil will clog the system and block this cleansing process. The key Ayurvedic therapy to steady the mind, strengthen the senses and the classic external treatment for mental strain, insomnia, stress, tension headaches, migraine and anxiety. This treatment includes a soothing upper body Abhyanga Massage. Kindly re-schedule for another time if you are experiencing fever, head/chest inflammation, eye/ear/throat/sinus infections, flu & heavy cold. 45 minutes Rp. 265.000 | The treatment for all travelers! This treatment deeply penetreates the body and nourishes and relaxes the nervous system bringing you to a profound state of deep relaxation. Lots of travel tends to raise Vata, the wind and space element in our body, often causing constipation, insomnia, scattered mind, nervousnees -anxiety, dry skin and feeling ungrounded. This treatment targets the lower back which is the main seat of Vata thereby bringing you back down to land on the ground. Kati Basti is the traditional pain relieving treatment for mid to lower back ailments such as: stiffness, impaired mobility, constipation, sciatica. Please book this on a day and time that you can rest for a few hours directly after the treatment. Please discuss with our specialist if you are experiencing inflamed kidneys, or arthritis of the spine. This therapeutic treatment reaches deeply into the whole physiological and emotional system through the key energy points called Marmani. Foot Acupressure Massage increases circulation of blood, lymph and vital fluids throughout the whole system and is recommended as part of Ayurvedic treatment for insomnia and eye strain.